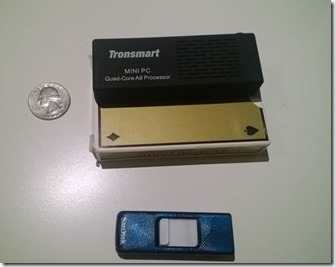 Well after two weeks in shipping, I received my Tronsmart MK908 Android Mini PC. While Android is typically used in smartphones and tablets, someone got the idea of putting Android on a tiny PC about half the size of a deck of cards. 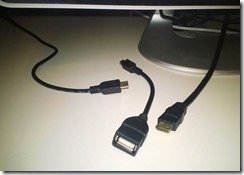 Instead of having a built-in touch screen for operation, these devices plug into a standard HDMI port on a TV or computer monitor. The device itself came in very nice retail packaging and included the appropriate HDMI and USB cables. That was good because I was worried that cables were going to raise the total cost of this operation. 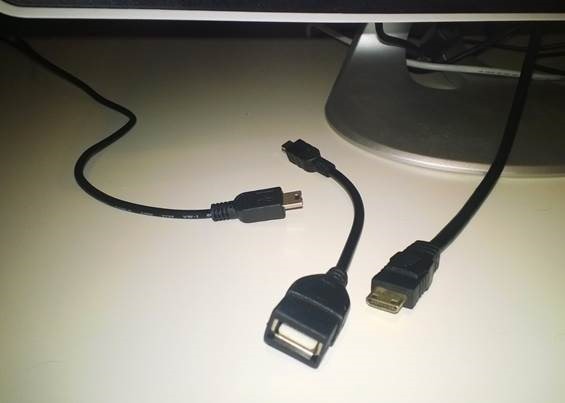 There is nothing particularly wrong with this hardware set up, but both mini HDMI and mini USB are not used as much anymore. Fortunately, the included adapters allow you to get everything plugged in right out of the box. You can plug a regular USB device into the main USB port and you get a second USB port when you use the adapter for the OTG mini USB port. That gave me room for a mouse and keyboard. Audio worked great with my Bluetooth speaker. If you read my first post about this topic, you know that one of the main goals was to explore Android mini PCs as desktop replacements specifically for kids to use for word processing. Of course there are many other tasks that an Android PC can be used for, such as media consumption and gaming. When I first got the unit out I was thinking "Sweet! I have Android running on a huge TV!” Then it quickly turned into, "Oh, I have touch based Android running on a big TV without touch." I did have a bit of a rough time getting used to Android on a big screen. That is partially because I am picky. I had the MK908 hooked up to my TV which was working fine. But I had a terrible Bluetooth mouse and the keyboard cord wasn’t quite long enough to get comfortable. To top it off I had connectivity issues when I started using the device. Now I am using it plugged into my desktop monitor, which means that my keyboard is within easy reach and I also have my regular mouse plugged in. Mouse and keyboard performance can make or break the experience in almost any computing situation. If you wouldn’t like using a certain mouse with your daily computer you won’t like it any better just because you are plugging it into a much more inexpensive piece of gear. After getting the mouse and keyboard issue settled, I was able to log in with my Google account, which synced mail, contacts, and calendars as expected. I was also able to download apps from the Google Play Store. This is an important note, because some Android devices don’t come with the Play Store installed. I downloaded some basic apps like Astro File Manager, Twitter, and Google+. These were the apps I played around with while getting used to the mouse and keyboard. When you are using a mouse on Android, the left click is the same as a tap, left click and hold is the same as tap and hold. Right click produces the back function on Android. At first this is annoying, because I kept clicking and expecting a context menu to appear, but it would take me back out of what I was doing. However as I got used to it, it became a natural way to use Android. In fact, now I keep right clicking in Windows 8 hopping it will take me back. The scroll wheel on your mouse works for scrolling in Android as well. The next test was to see how Android and the MK908 performed for word processing. Up to this point, whenever I would enter text, the on-screen keyboard would pop up and cover half the screen. This didn’t really matter if I was just doing a search or something, but as soon as I started composing a document it became annoying. At some points the only line of text I could see was the single line that I was typing on, just because the keyboard took up so much space. After a quick search and I found a clever app called Null Keyboard. It hides the on-screen keyboard which is perfect for what I am doing. Problem solved. 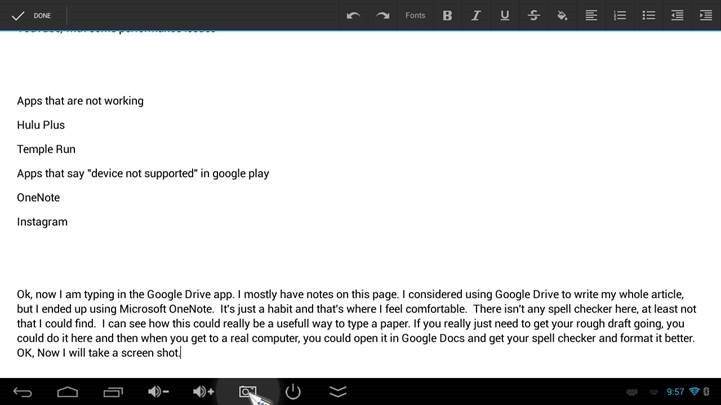 There are many options to access Google Docs on Android. You can use the Google Drive app or the web browser and with the web browser you can chose between the mobile version and the desktop version. The Chrome browser works really well on Android and desktop mode is very similar to Chrome on Windows or Mac. There shouldn’t really be a need to use the mobile browser version of Google Docs. 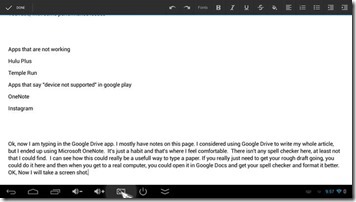 The Google Drive app gives you a plain, but easy to use way to enter text and get your thoughts on the digital paper. The web version does have more features and gives you more of a "Document" feel in addition to including spell check. It did take me a minute to figure out how to get the browser to zoom correctly. You have to double click in a blank space, which goes back to the days before pinch to zoom when we double tapped our touch screen devices to zoom. While none of these word processing options are as feature rich as you would get in Microsoft Word, they do get the job done for some basic entry. Since many kids these days are already using Google Docs for everything, this might be an environment that they have no trouble working with. I also wanted to mention some apps that I got working and some that didn’t. Angry Birds, Twitter, and Google Drive had no issues. The YouTube app worked, but performance seemed better just using the web browser rather than the built in app. I tested Hulu Plus and Temple Run. They installed, but did not function with the current software version. Certain apps got the "device not supported" response from Google Play likely because Google Play sees this as a tablet and the apps are for phones. Instagram was one of those, along with Microsoft OneNote which was big disappointment since OneNote has become the single most essential app to me. Overall any Android Mini PC is going to take some getting used to. In a short while I was comfortable enough to do some basic web research and type up the rough draft of a paper using the Google Drive app. 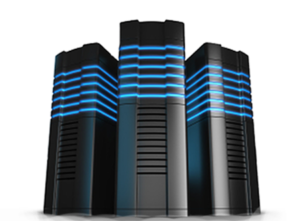 There are lots of people having success with these devices as gaming machines and media centers as well. If you are willing to take the time to set up an Android mini PC for yourself or someone else, I think that you could have a pretty neat device for not a lot of money. The next step is to see if kids can use an Android mini PC for doing homework. I expect to pass this along to my brother (an 8th grade student) without very many issues. He is pretty familiar with Android, and I think his perspective will be that anything that works on it is something he didn’t have access to before. If something doesn’t work, he will probably just do without. The big question will be whether or not he ends up using it on a regular basis for homework and typing papers. Will this play Internet based video to a TV smoothly? Like German TV?